CHRISTCHURCH: It was a tale of two debutants on a fascinating day of Test cricket where ball dominated the bat. Although the final analysis of 13 wickets for 237 runs would suggest a menacing surface, the truth was that a lot of batsmen, especially from Pakistan, were out poking or trying to play expansive drives. New Zealand fared much better with the bat, and held the aces as the first Test moved forward at a breakneck speed despite an entire day being washed out by rain in Christchurch. Colin de Grandhomme, the Harare-born Auckland allrounder who had previously taken just one five-wicket haul in 83 first-class games, had the best figures (6 for 41) by a New Zealand debutant. It meant Pakistan, sent in to bat, were rolled over for 133. Misbah-ul-Haq, captaining his country for the 50th time, top scored with a typically feisty 31 off 108 deliveries during the course of which he proved it was the top order’s impatience and not a menacing Hagley Oval green top that contributed to their downfall; no other batsman crossed 20. In reply, Jeet Raval, the other debutant, replacing Martin Guptill, overcame a testing new-ball burst to finish 55 not out as New Zealand recovered from early losses of Tom Latham, Kane Williamson and Ross Taylor to end on 104 for 3, trailing by just 29 runs. 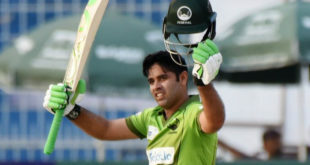 Playing late and committing himself wholeheartedly to his strokes, both off the front and back foot, he picked off seven boundaries and looked at ease even as his partners largely struggled; particularly against Mohammad Amir in a probing opening spell that read 6-2-6-1. Things could have been much worse for New Zealand had Henry Nicholls, replacing Luke Ronchi, not substituted flamboyance for grit and patience to finish unbeaten on 29. The fourth-wicket pair added 64, but in blunting out 19.4 overs, they ensured New Zealand had limited the new-ball damage to potentially make run-scoring a lot easier on the morrow. The surface demanded patience which Pakistan clearly lacked, as their top order crumbled after a solid 31-run opening stand that frustrated New Zealand. In trying to bowl full and swing the ball late, their new ball pair of Tim Southee and Trent Boult either slipping the ball down the leg side or bowl it full and wide in the first hour as Sami Aslam and Azhar Ali went into their shell, seemingly happy to blunt the new ball. Then Williamson turned to de Grandhomme’s seam-ups over Neil Wagner’s bustling pace, and the move worked immediately. After two poor overs in which he sprayed the ball, de Grandhomme broke through when he scythed through Azhar’s defence with an in-dipper. The old adage of ‘one brings two’ ensured when Southee, brought back form the other end, sent back Aslam, who jabbed hard to get a thick edge to Raval at second slip. Babar Azam was reprieved on 4, but couldn’t curb his instincts of trying to drive on the up as he was also pouched in the slips. When Younis Khan’s flashy cover drive to a delivery he could have left alone off de Grandhomme was pouched by Raval in the cordon, Pakistan had sensationally slipped from 31 without loss to 56 for 4. Pakistan slowly rebuilt through a 32-run stand, but the lunch break came to New Zealand’s rescue as Asad Shafiq, demoted to No. 6 after a fruitless stint at No. 3 in the UAE, poked one to gully. Sarfraz Ahmed tried to unsettle the bowlers by walking outside the crease, giving bowlers the charge and play a typically aggressive game. Not even being hit on the helmet by a steep bouncer altered his approach. Eventually a tame waft resulted in a simple catch at gully to a relieved Todd Astle, who put down a chance earlier in the day. Watching the carnage unfold, Misbah continued to bat on in the hope that he would find some support from the tail. But such was the nature of Pakistan’s collapse that Williamson resisted temptation to give his faster men a break, and go for the kill. Boult and Southee overcame insipid starts to finish with two wickets apiece. For a while it looked like New Zealand’s top order would match Pakistan’s indiscretions. After Tom Latham was lbw to Amir, Williamson, in particular, fell tamely when he pushed away from the body – neither attempting a punch nor a full-blooded cut shot – to be caught at slip. Ross Taylor, all at sea against Sohail Khan’s late away-swing, was snaffled down leg side to extend his lean patch to 10 innings now to open up the game. With over 25 overs left, two more wickets then may have tilted the scales Pakistan’s way. That it didn’t was largely due to Raval’s steadfast determination and Nicholl’s grit that capped off an eventful day. Debutante opener Jeet Raval posted a half-century as New Zealand reached 104-3 at stumps on day two of the first Test against Pakistan in Christchurch on Friday. On the first day of play, after the scheduled Thursday start was washed out, Pakistan were all out for 133 after being sent in to bat. Raval, also in his first Test, was 55 not out at the close of play with Henry Nicholls on 29 as New Zealand trailed Pakistan by 29 runs with seven wickets remaining.